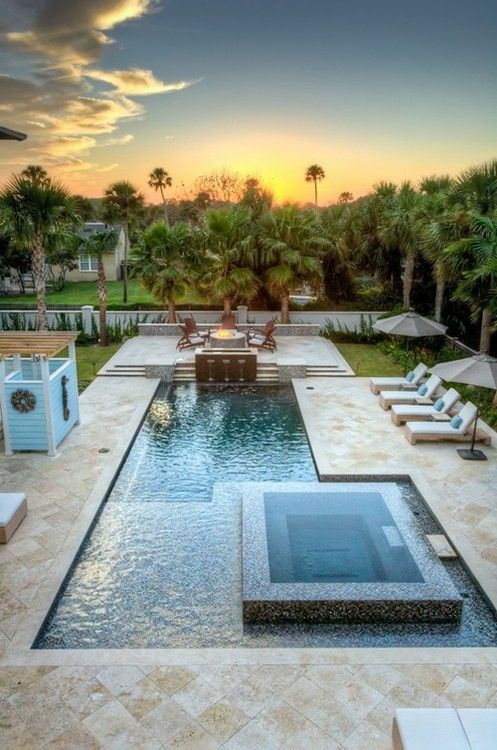 When it comes to swimming pools, I prefer designs that are an integration of the home’s architecture. 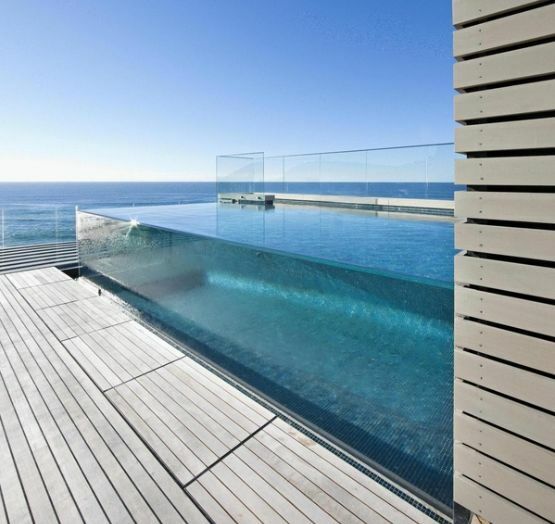 When it comes to swimming pools, I prefer designs that are an integration of the home’s architecture. 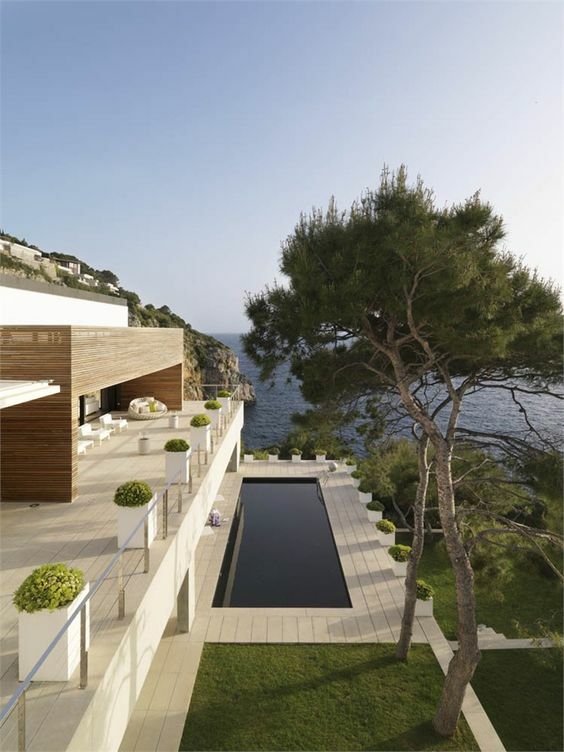 For me, the pool has to be parallel with the home’s interior — I gravitate toward designs that are very structured. 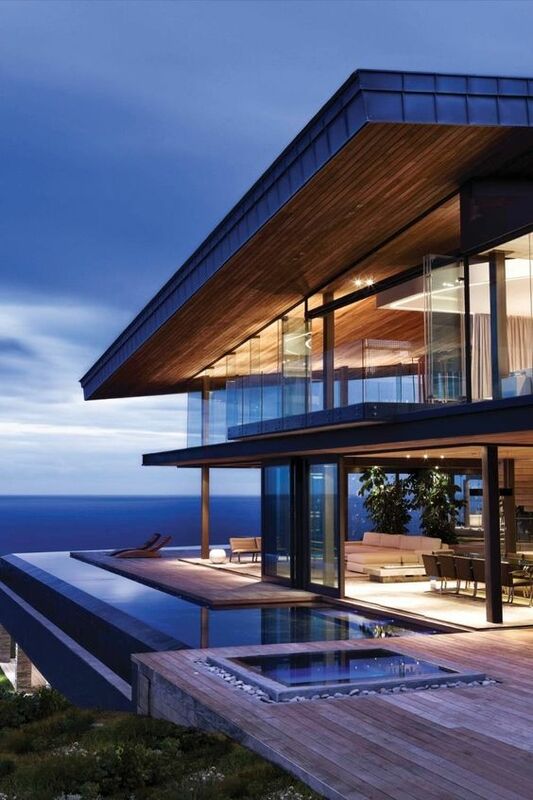 Infinity pools are hot right now if you have the environment for one. The landscape around the pool can complement the style of the pool or have a more organic feel. 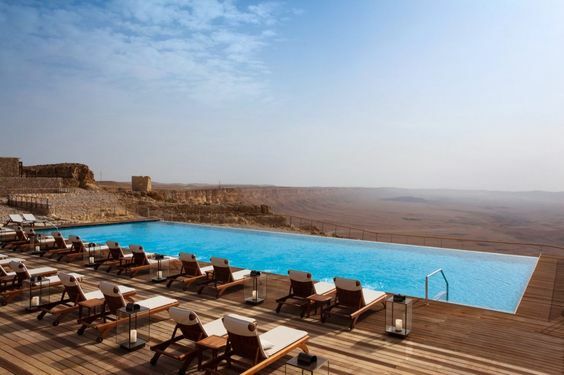 Here are some examples of gorgeous swimming pools. 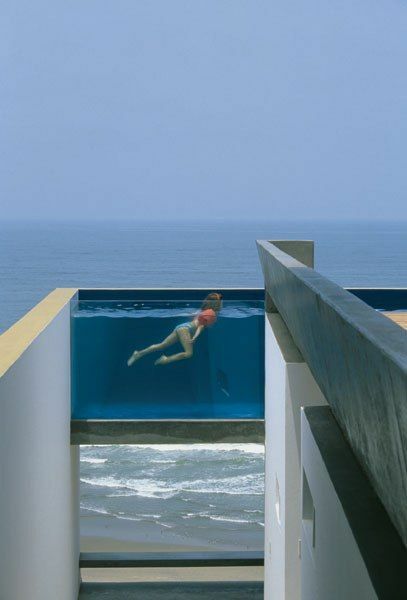 What does your ideal swimming pool look like? 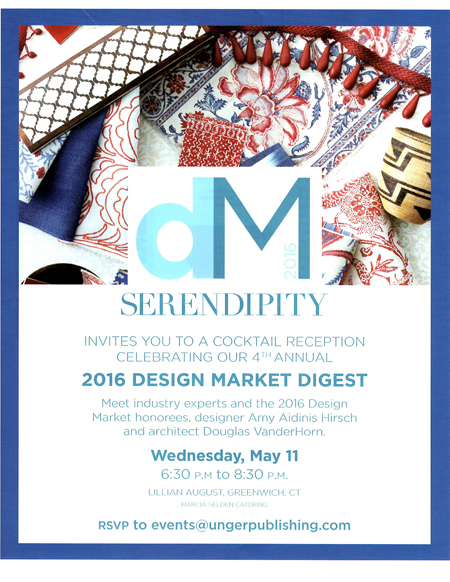 I’m very excited to be a Serendipity Design Market Digest Honoree! I’m very excited to be a Serendipity Design Market Digest Honoree! Tonight is the cocktail celebration for this year’s Design Market Digest and I am really looking forward to it. I’d like to thank Serendipity for this great write up by Amy Levin Epstein about my approach to interior design and why I was chosen as this year’s Honoree. 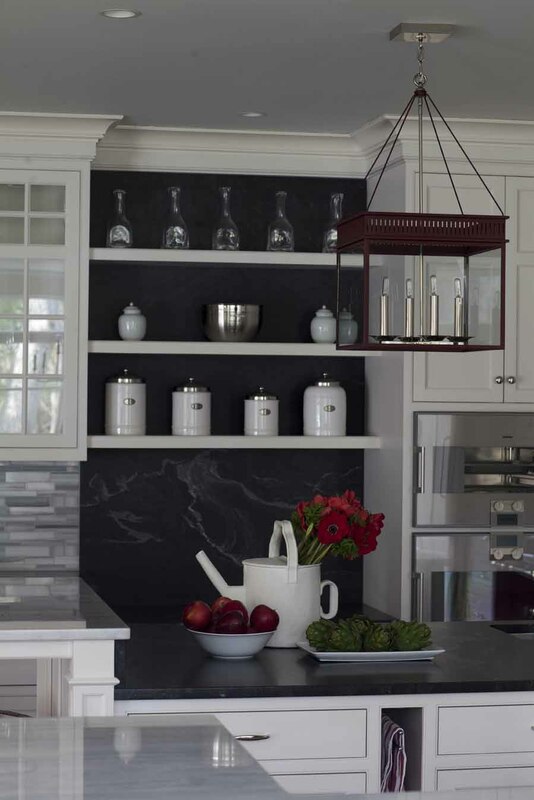 When the founder of Amy Aidinis Hirsch Interior Design, LLC, takes on a new project, she first reflects on a home’s past. “Every house has a history or a story, even if it is brand new. The architecture is my primary focus, as well as the land which the house is nestled in,” says Hirsch. She will examine the details, from paneling to wood flooring to original ceiling treatments, and identify ways to enhance them. 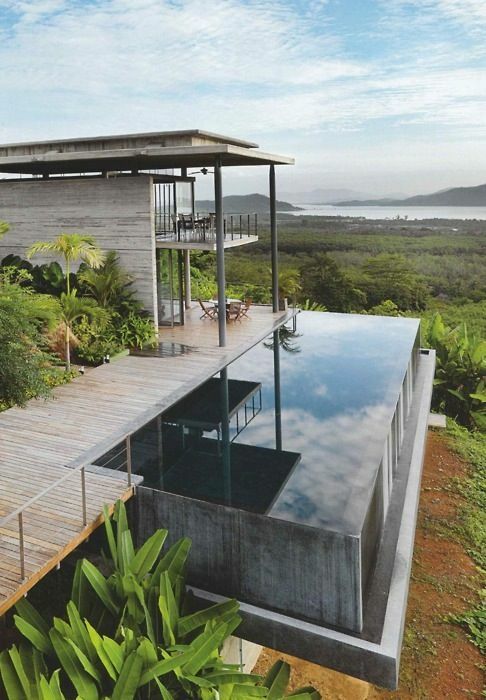 With the house in these photos, she focused her work around existing water views. 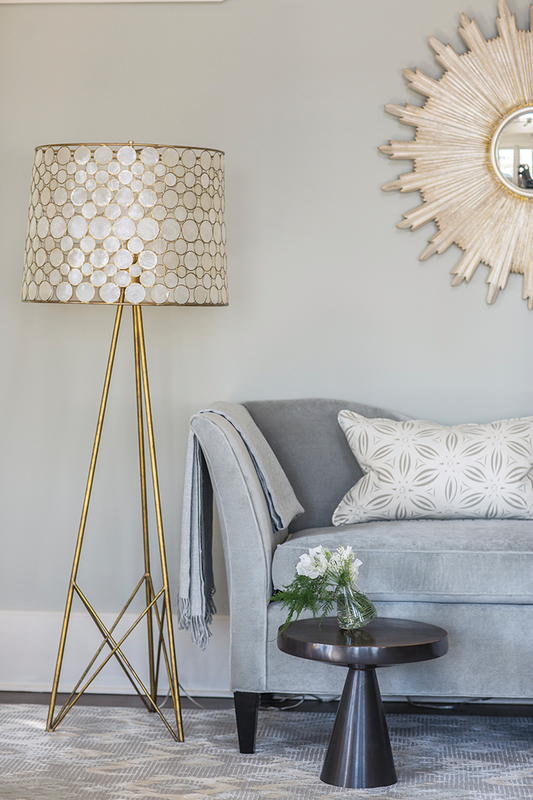 “Everyday is a changing back drop so I wanted to embrace the interior, capture moments of the exterior, yet add a bit of femininity which reflects the home owner,” says Hirsch. 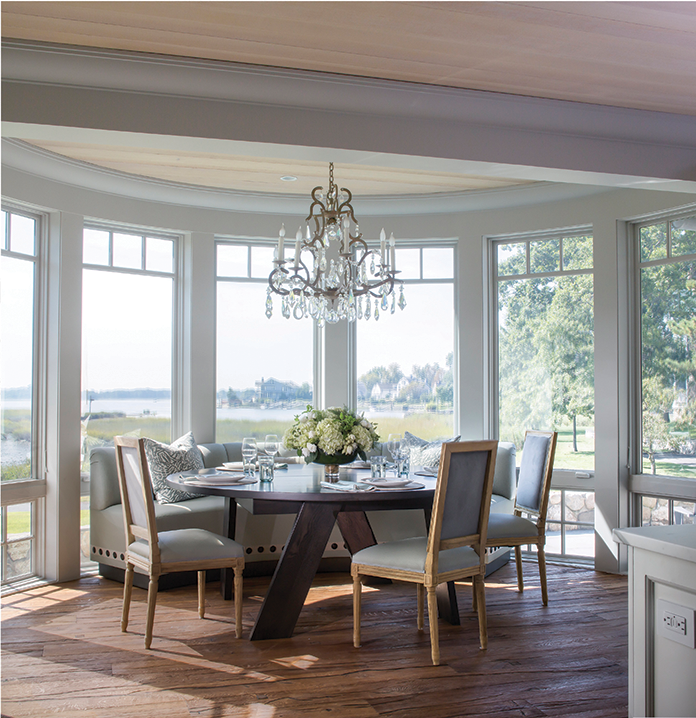 “To be surrounded by the view of Long Island Sound and the marsh—what’s not to love?” says Hirsch. 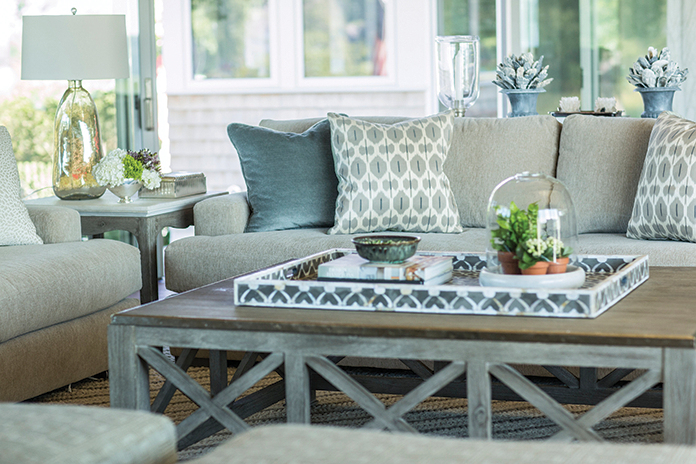 Comfortable sofas are covered in a sage green mohair and paired with a durable extra large coffee table. Hirsch is well known in Fairfield and Westchester counties, as well as farther flung locales like Boca Raton and Montana, for her style, which she describes as “tailored and masculine, subtle and unexpected.” Those unique characteristics take time to pull together and Hirsch says she makes it a priority to speak with new clients about realistic timelines. “This is an investment and should be about the longevity, not about instant gratification. The creative process has to be organic and fluid. Everyone is excited, however, the process needs time to curate,” says Hirsch. Brass accents create a chic lounge area in the master bedroom. 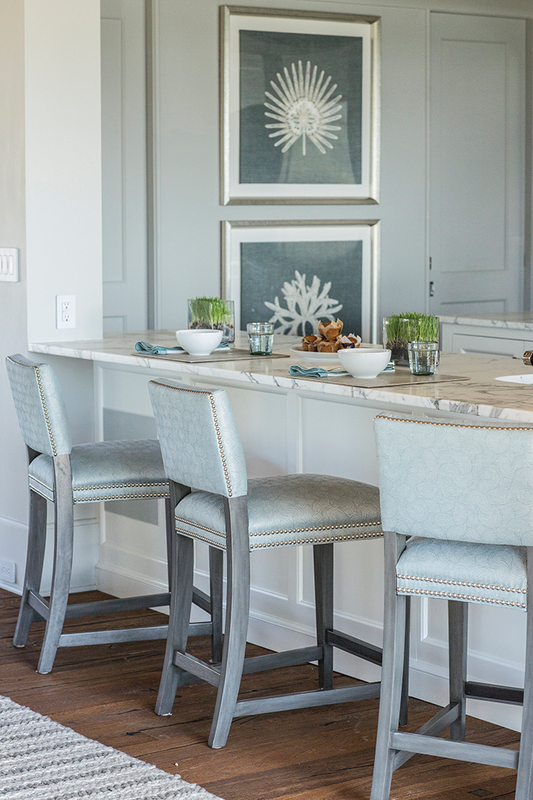 Trowbridge Gallery embroidered prints hang above the breakfast bar. Your top design tip: Push the envelope. Favorite restaurant in the area: Winfield’s—but you need a ferry to get there! People would be surprised to know: I love art deco. Favorite room in your home: We are house hunting—so I will let you know! 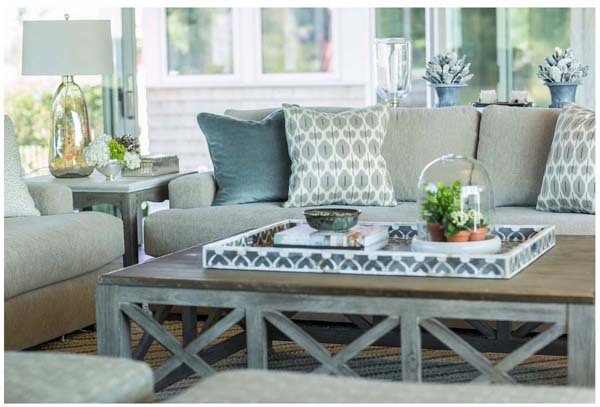 You’re invited to a cocktail recption celebrating our 4th annual 2016 Design Market Digest. Meet industry experts and the 2016 Design Market honorees, designer Amy Aidinis Hirsch and architect Douglas VanderHorn. 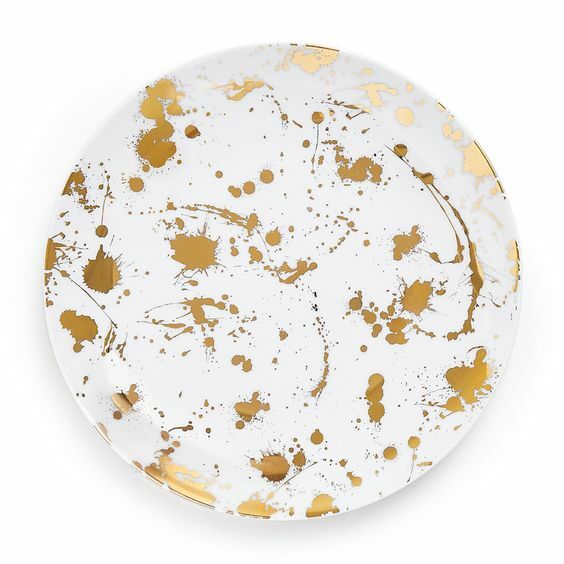 I had an idea for a Pollack-like, splatter look for a client’s wall that was inspired by some very cool splatter designs I’d been seeing. I’m often fascinated by what comes up during the course of a project. I had an idea for a Pollack-like, splatter look for a client’s wall that was inspired by some very cool splatter designs I’d been seeing. I like how the splatter can be condensed or loose. Splatter ceiling. 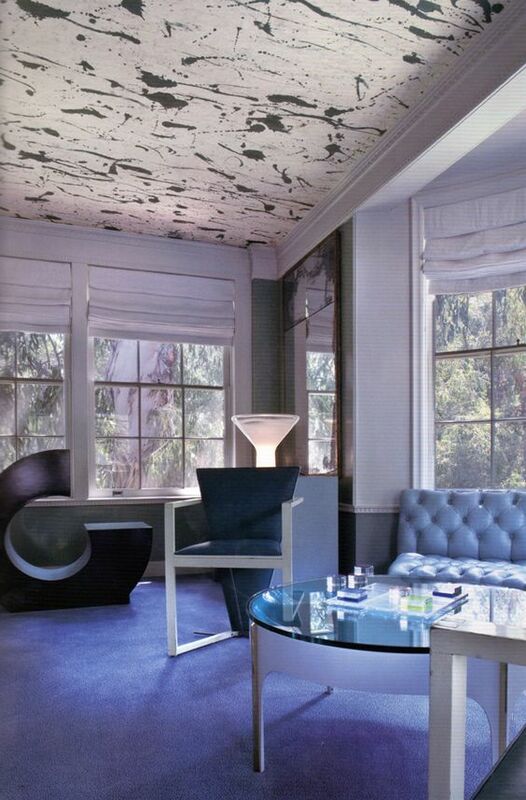 Design by Kelly Wearstler. 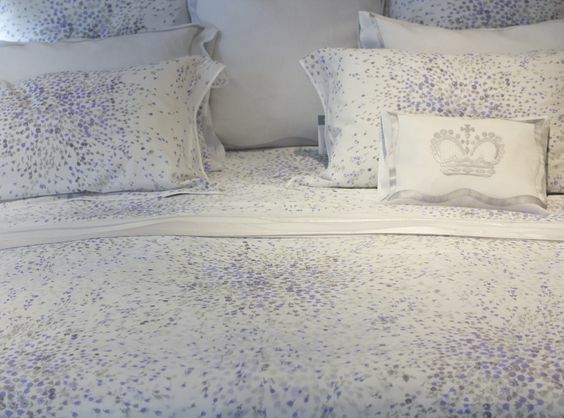 Splatter bedding from D. Porthault. 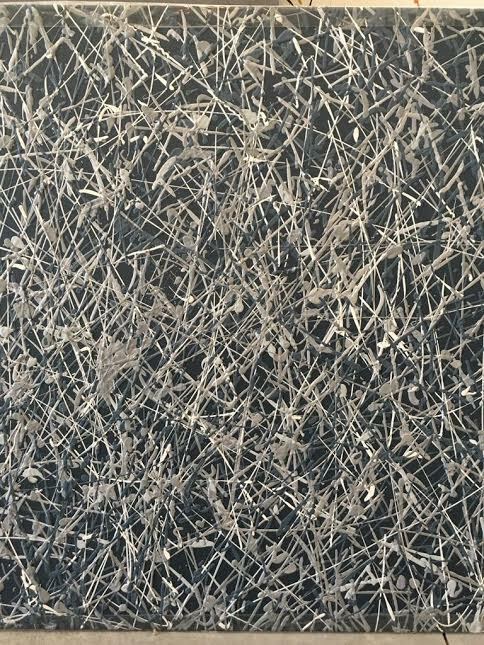 When coming up with a splatter design for my client, I worked with an artist to develop not only the look I wanted, but the correct consistency of paint. The key was to use a paint that would splatter on the wall, but not drip. It took some trial and error to concoct just the right mixture. One of the splatter sample panels I designed. 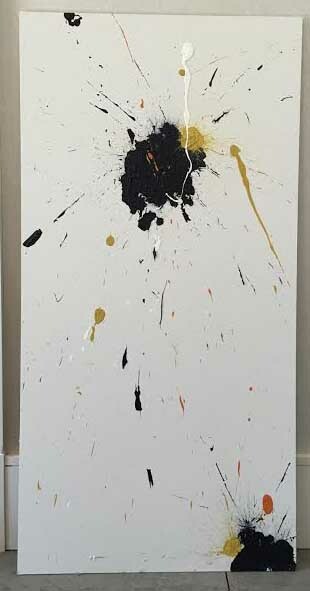 Another, looser, splatter panel I showed my client. Even though the client chose not proceed, it is all about the process and the journey. Working with the artisan to understand the process and the selection of the correct color palette to make the masterpiece come together was a great experience. It’s also fun looking forward to the moment of being inspired by that client who opens the door for exploration into something unique. I’m so pleased to have an entryway I designed featured in the April 2016 issue of Serendipity Magazine! I’m so pleased to have an entryway I designed featured in the April 2016 issue of Serendipity Magazine! 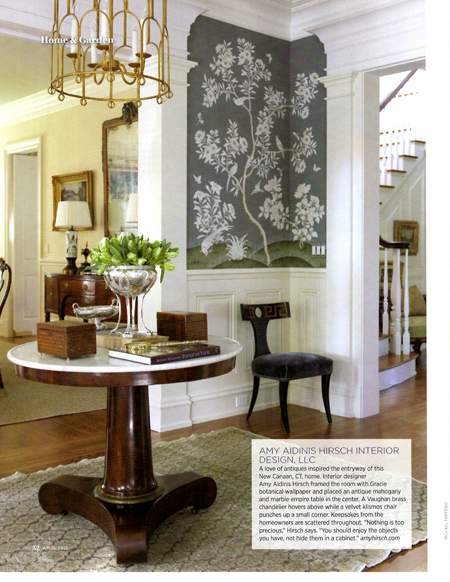 This entry was designed for a home in New Canaan, CT, and was inspired by the client’s love of antiques. Also in this issue is an invitation to a cocktail reception celebrating the 4th annual Serendipity 2016 Design Market Digest. This May 11 event will take place from 6:30 to 8:30 P.M. and will feature industry experts, including two Market Honorees. I am very happy to be one of this year’s Honorees along with architect Douglas VanderHorn. The cocktail reception will be held at Lillian August in Greenwich. You can RSVP to events@ungerpublishing.com. I hope to see many of you there! 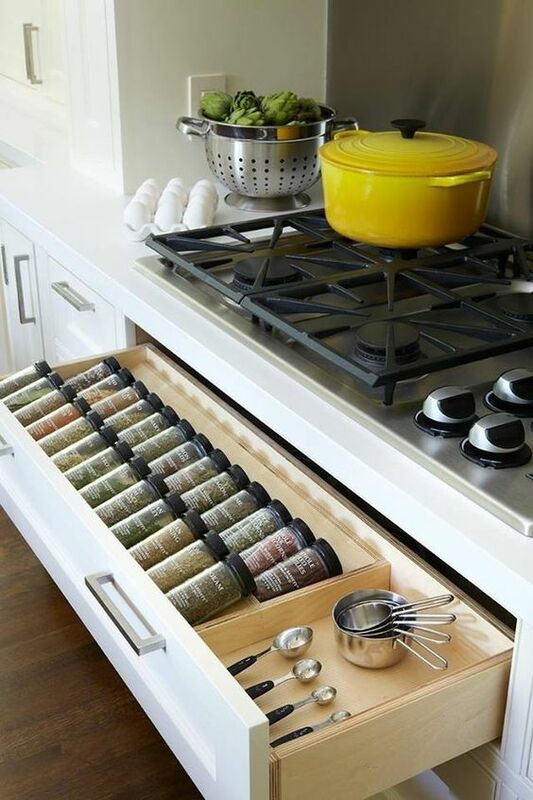 The key to a great looking kitchen is organization. 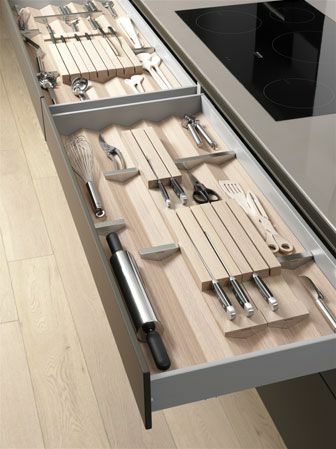 The key to a great looking kitchen is organization. 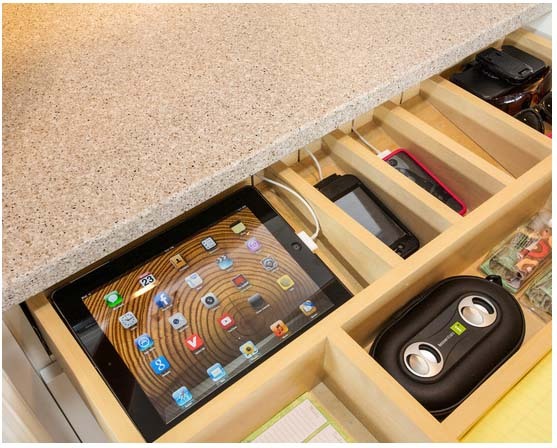 In order to have uncluttered counters and tabletops, your storage solutions must be smart, suited your lifestyle, and designed to avoid wasting space. A kitchen takes about 12 to 14 weeks to build. It’s important to consider how the space will be used so the design includes strategic storage solutions. 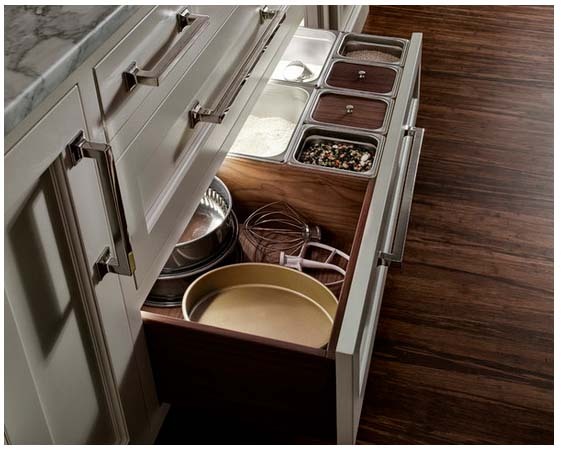 Think about where you cook, how you clean, and where you can store specific items. How close to the range do you want spices, oils, and utensils? Which kitchen items do you need close at hand, and which do you only use rarely? 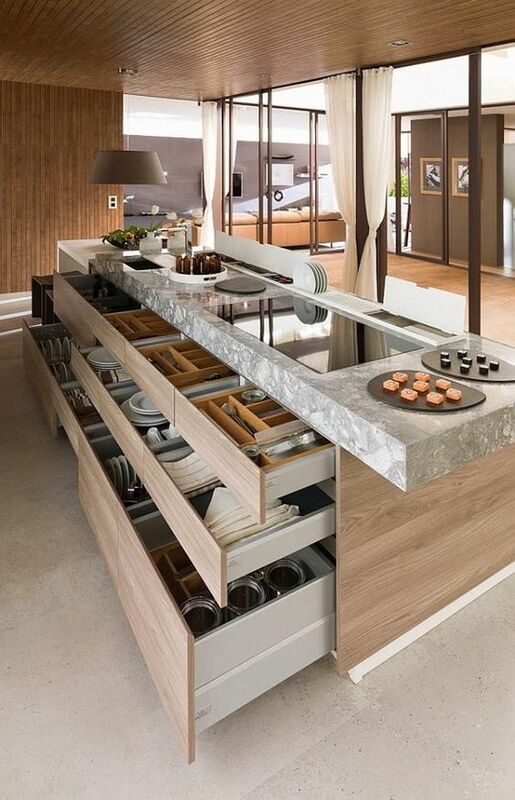 When designing a kitchen, I look for storage and organization solutions that work for each client’s needs. Part of designing a kitchen involves editing out superfluous items. It’s more difficult to be organized if you have too much of everything. Do you need five wine openers? Focus on the basics, not on overabundance. 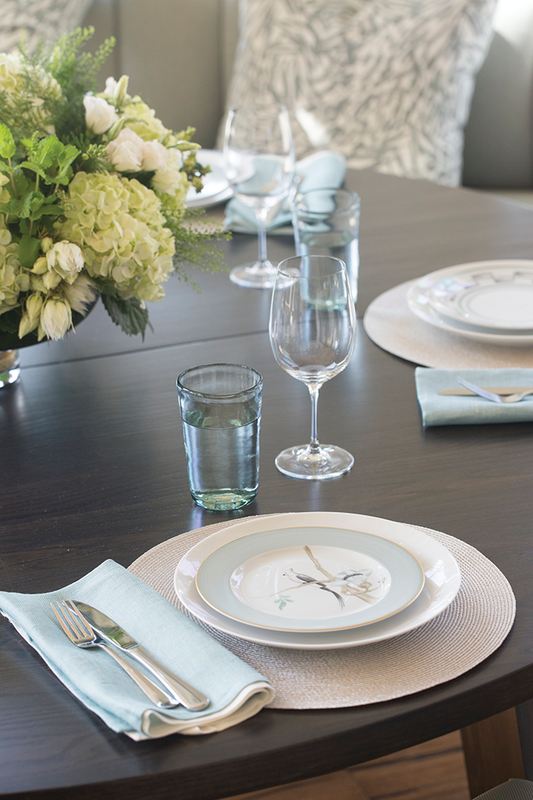 I also plan for the client’s storage needs in terms of dinnerware. Today’s plates are big, sometimes 12 or 13 inches in diameter. 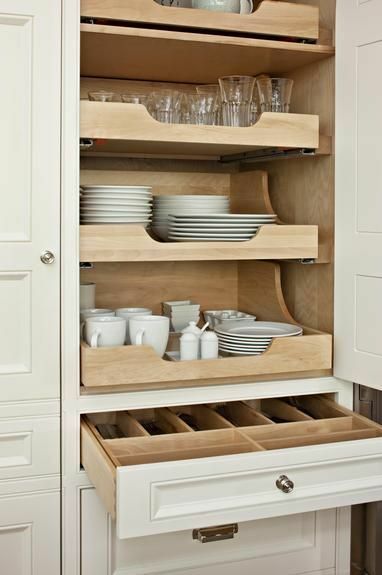 Typical kitchen cabinets may not work for oversize dishes, so I find a 14 inch clearance is ideal. I also love it when the insides of cabinets and drawers are finished. They should look beautiful when you open them! 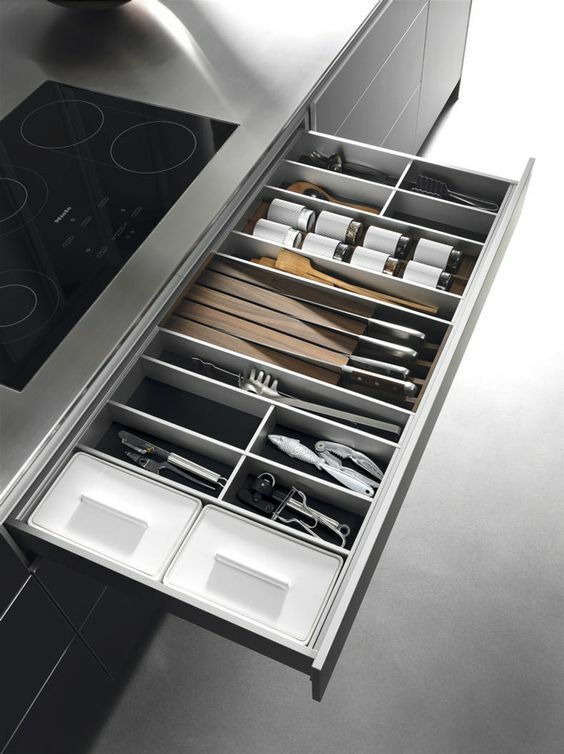 If you plan to renovate your kitchen or are building a home, think beyond the surface beauty of kitchen design and explore organization solutions that will allow you to truly enjoy the space. Think about how you use your kitchen — are you a baker, an entertainer, an accomplished home chef? Thoughtful design is essential! 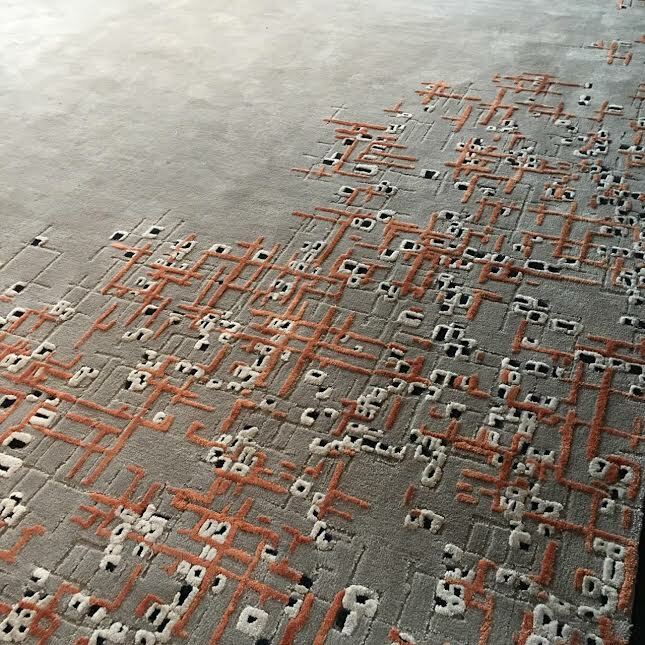 About half of the rugs I install for clients are custom, which really allows us to hone in on the color, style, construction, texture, and pattern of the piece. I love custom rugs. 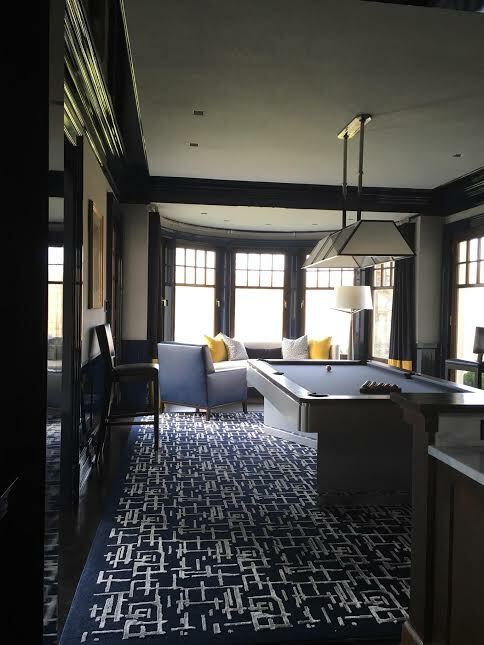 About half of the rugs I install for clients are custom, which really allows us to hone in on the color, style, construction, texture, and pattern of the piece. 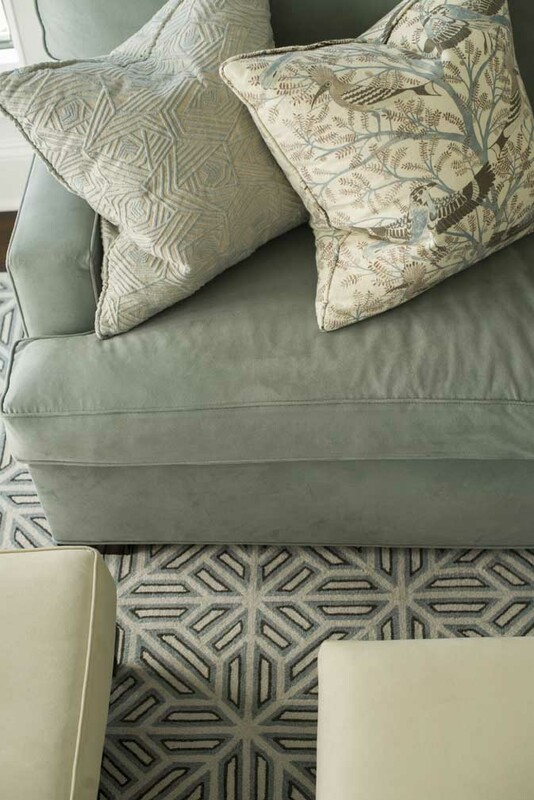 If I see a rug that I feel isn’t quite right for a client, I can adjust the color or keep the pattern but change the construction. The beauty of a custom design is that we can design a rug around a particular room. Sometimes I will see a big rug that’s perfect for a client but needs to be tailored down to fit a space. Or, I’ll really like the border of a rug so will keep that element but leave the rest of the piece open. 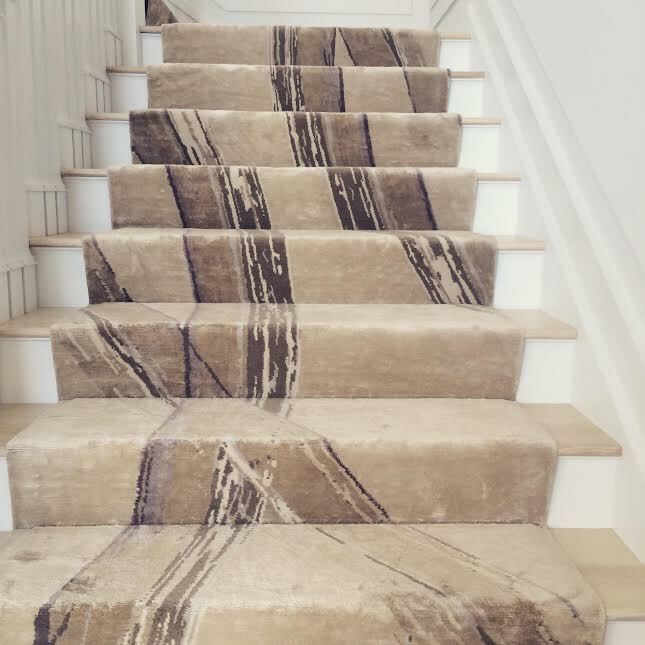 When designing a custom rug, you have to aware of geometry and how the pattern will lay out over the entire surface of the finished rug. You also have to take into consideration the amount of traffic a rug will endure. For family room, I would create a hand tufted, completely indestructible wool rug. Another rug might consist of linen and silk with a traditional sumac construction and an integrated weave of high and low pile. 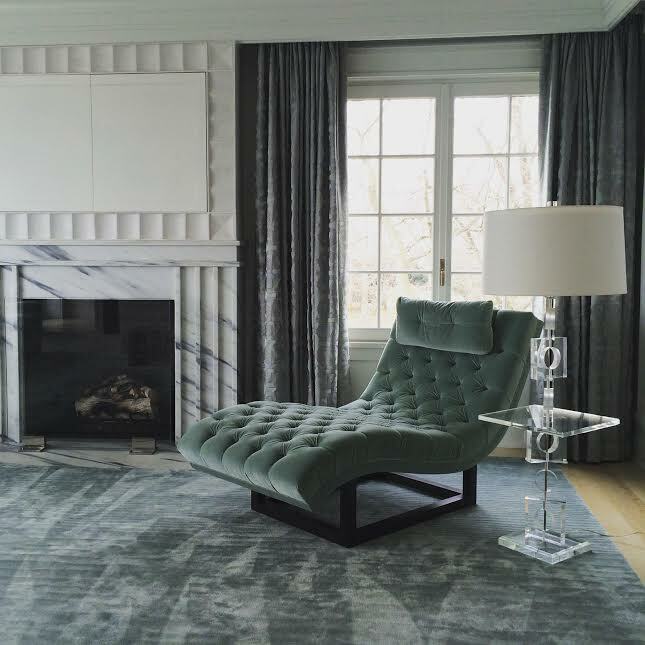 A custom design results in a rug designed to look, and live, perfectly in a space.